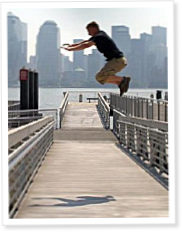 American Ninja Warrior brings sudden fame to previously unknown parkour athletes and freerunners who are only in it for the love of the sport. The television show American Ninja Warrior has bridged the gap between simple street tricks and sport, promising—and delivering—a measured degree of mainstream fame for popular YouTube antiheroes such as David “Flip” Rodriguez and Drew Drechsler. 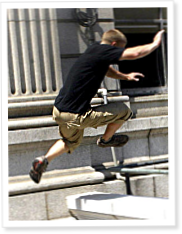 Ryan Ford explains five basic parkour-inspired exercises you can do in the urban jungle. 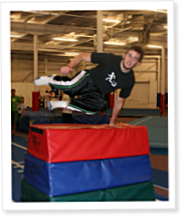 Parkour is an art of movement in which you train the body and mind to overcome everyday obstacles with speed and efficiency. Mechanics, consistency, and intensity are the three pieces of a complete foundation for a safe learning progression in any new endeavor. 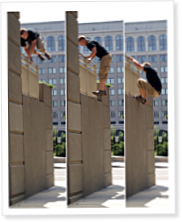 Many of the elements inherent in the gradual and progressive creation of elite general physical preparedness apply equally to the pursuit of more specific skills and goals, including parkour, the ability to navigate your environment functionally, confidently, and safely in a variety of situations. My last article described some of the techniques you can use to move up and over vertical objects you might encounter during a run. Now it's time to learn ways to make the most of these obstacles by incorporating objects at height into your run. The turn vault and cat leap are two climbing-based movements that use (and thus develop) the absorptive strength and explosive power of your upper body.